God and Alzheimer's - Forgetting Whose We Are"
You are here: Home Alzheimer's - The Marriage Vows - Infidelity, Adultery and Love! 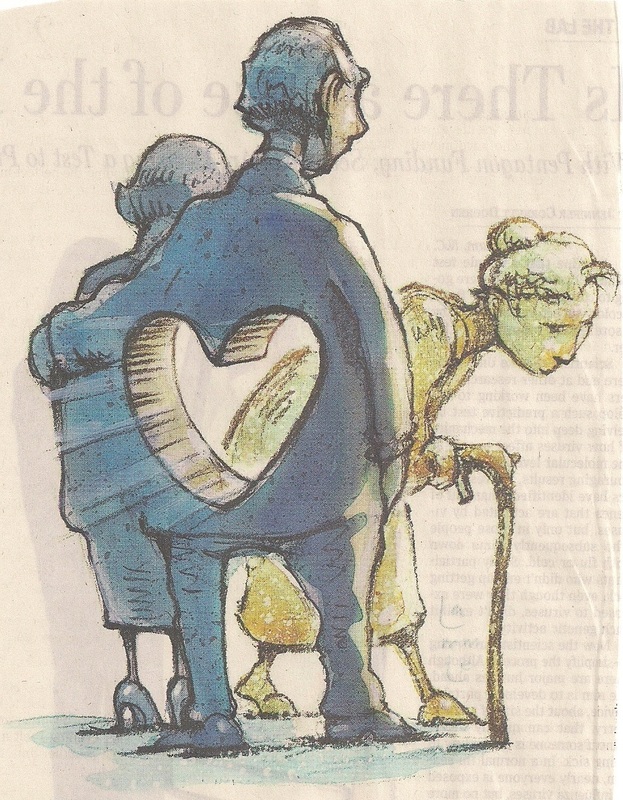 "ALZHEIMER'S - THE MARRIAGE VOWS - INFIDELITY - ADULTERY and LOVE"
A few years ago in the 3 November 2009 issue of the Wall Street Journal there appeared a very troubling article by Alicia Mundy entitled: “Of Love and Alzheimer’s” – “When Caregivers Find New Companions, Is It Adultery”. The accompanying Wall Street artists drawing was poignant and heart breaking. A number of professionals were consulted and their comments were reported as well as discussing a case history. Much ado was made of the emotional toll on the caregiving spouse and how they became the second victim of Alzheimer’s or the involved dementia causing disease...that such spouses were more likely to die themselves within a year of the afflicted spouse’s death. 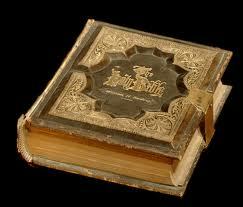 The article discussed how “Religious leaders have come down on both sides of the issue. 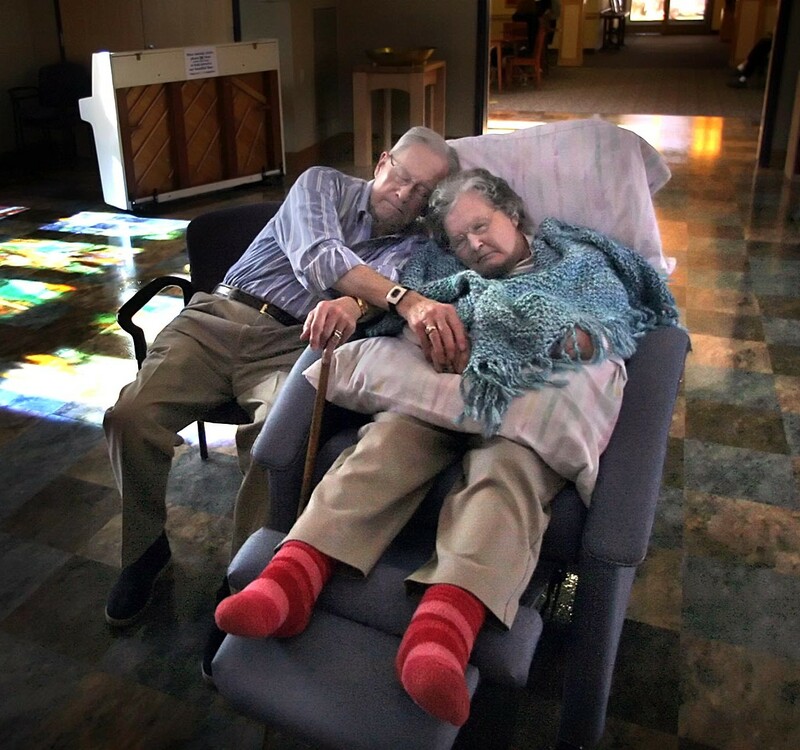 “We have made the marriage vows “for better or worse…that holds in sickness or in health.” Says Richard Gentzler Jr., director of the Center on Aging and Older Adult Ministries for the national United Methodist Church. “I recognize the pain of the husband, but sexual relations would be adultery”. I remember at the time how troubling this idea was to me but tended to put it aside as an aberration that would have no following. Obviously I was wrong about this current society. I looked at my own relationship with June as well as my close friend Dr. Don Fox who had a wife Gloria also deep into Alzheimer’s. June went 12 years to termination and Don’s wife Gloria went 15 years. I recall specifically discussing with Don that the lack of intimate relationships with June had not diminished June and my relationship but in fact had enhanced it into a much deeper love and the desire to protect and care for her. Don said that he was in full agreement with me and felt the same in his relationship with Gloria. In fact, I would say that Dr. Don Fox is perhaps the best real world example of what a husband should be in support of his Alzheimer's wife. Don has traveled alongside his wife Gloria every step of her journey through the darkness of Alzheimer's. Don has been a partner with Gloria in her journey, providing love, care, comfort and support for 15 long years without missing a step or faltering along the way! Don never had a thought to do otherwise! 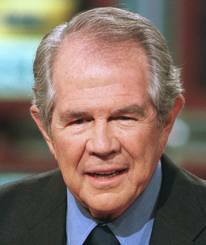 In September 2011, the televangelist Pat Robertson responded to a readers inquiry about marriage and Alzheimer’s by a very startling reply in which he endorsed divorce in such a case stating: “This is the person that you have loved for 20, 30, 40 years, and suddenly that person is gone.”…”I know it sounds cruel, but if he’s going to do something, he should divorce her and start all over again, but to make sure she has custodial care, somebody looking after her.” His response so angered me that I immediately ceased the monthly contributions that I had been making to his ministry and his CBN radio ministry in June and my name. Stan's Note: My wife June was always more comfortable having me around caring for her even though at times she did not recall who I was…I recall very vividly the time I was sitting with June among other late stage Alzheimer’s residents of an Alzheimer’s assisted living facility…the others were talking about husbands…June then remarked “I don’t have a husband!”…I then reminded her that I was her husband…she looked at me with a confused look and said, “I forgot.” I also recall that one day she introduced me to a new male friend. I also recall that this new male friend of June's would often look at me with angry eyes...He thought June belonged to him...I understood what was happening and that this was the disease talking and not June or this new male friend talking...June was still my wife and I loved her dealry. This was the same June who would at times cry when I left for the day even though I assured her I would promptly return! I can also recall at times I would leave the building for the day and also have tears in my eyes. The thought of abandoning June for another female relationship never entered my mind. Such a suggestion to me would have been insulting! In the current issue of the AARP Magazine for November 2011 this matter again rears its ugly head in an article entitled: “When the Vow Breaks”…”Is infidelity justified if your spouse has dementia” by Mary A. Fischer. Again professionals are being quoted in support of an apparent changing society. It is some comfort to see that the Catholic position does not appear to be changing. “Sheila Garcia who is associate director of the U.S. Conference of Catholic Bishops office on marriage and family life says: “Certainly this kind of situation is heartbreaking…However the Catholic Church’s teaching on adultery is quite clear: It is absolutely forbidden”…It is also said that many religious and ethical teachers agree. Editorial Note: I often hear the reference to an Alzheimer’s patient living for 20 years. This is more theory than actuality…Such longevity with this disease is certainly rare! I have never seen one in the many years that I have been a caregiver to Alzheimer’s victims and a visitor to Alzheimer's facilities. (My mother went approx... 7 years while my wife June went almost 12 years. President Reagan went 10 years and Charlton Heston only a little past 5 years….my friend Don Fox's wife Gloria went 15 years. The longest that my research has found was Margaret Thatcher, Prime Minister of the United Kingdom that went 17 Years. The average is 8 years. Admittedly, these are all very long times compared to other diseases such as Cancer. Where there is a true love by the caring spouse, the number of years does not cause a breakdown of that love, the relationship or the dedication to the needs of the afflicted spouse. If anything, love becomes more enhanced. This is all very troubling to me. it appears that society is on a path to recognize and approve the abandoning the Alzheimer’s spouse in favor of granting the caregiver spouse the freedom to find another relationship. It further appears to me that this is all a part of an alarming trend in modern society. A trend to permit the pursuit of complete freedom in order to find individual happiness regardless of the collateral damage. The basic morality of the past, the bedrock of what is right and what is wrong that most of us have come to rely on, to cherish and value in our society is being abandoned. It is abandoned in the pursuit of the greatest possible individual freedom and individual rights. The victim of this disease is to become a marriage casualty. I cannot imagine the mental stress and the horror of the newly discovered Alzheimer’s diagnosis will be to the victim. Not only must he or she consider a long journey of into a confusing darkness but must also contemplate the fact that their spouse has license to sever his/her marriage vows and abandon them at the time of their greatest physical and emotional need. I hate to think that I must be a part of such a society. “On their wedding day, brides and grooms stand before God and family and friends and promise each other to be faithful ‘for better or worse, for richer and poorer, in sickness and in health’. I tell them of the fellow I heard of who thought this was the multiple choice part of the marriage ceremony. ‘I choose better – richer – health.’ But of course, nothing could be further from the truth. During our Redeemer Lutheran Sunday morning service on 18 September 2012, our Senior pastor David Glesne continued with a series of lectures on Love and the Bible commandments relating to love. Eros – meaning sexual or romantic love. Storge – meaning parent and child love. Phileo – meaning brotherly love. Agape – (Agapao) - meaning sacrificial love. I am far from an expert on the Bible but much is said in the Bible about love between husband and wife...while the Bible instructs wives to love their husbands, it sets a very high standard for the husbands love of his wife...in the Book of Ephesians chapter 5:25. the husband is clearly instructed to love his wife with a sacrificial love...I quote a passage from the King James Version. "Husbands, love your wives, even as Christ also loved the church, and gave himself for it." This passage has been interpreted in various ways but it clearly says that the husband should stand by his wife even if it means his death would result from his thus protecting her. The Bible takes a very serious view of husband and wife love. I have always hoped that I could respond without hesitation in a like manner if called upon to do so. That is not the kind of love that is here today and gone tomorrow. The Bible would never excuse a husband caregiver from exercising anything but a sacrificial or Agape love for his wife. Pastor Glesne has verified that my above quotation from the book of Ephesians, did in fact use the Greek word Agape in the original Greek Bible from which the translation was made into the King James Version in 1611.. This quotation also clearly describes June's love, the love that she gave me and it describes the necessary love of a caregiver!. The “Wrinkle Think” Blog by Thomas Torrey on 19 September 2011 had an interesting story of a husband care giver for his wife who suffers from Alzheimer’s. His attitude is a model for all husbands who have wives with this terrible disease. The husband, who is 78 years of age, has a wife in an Alzheimer’s facility in a South Carolina healthcare community. The husband John lives nearby in an apartment. They have been married for 55 years. Every day at 4 PM, John is said to visit his wife and feed her dinner and tell her of his day. “When we were married we understood that that would be a life long relationship. That was important to both of us. She can’t carry her end of it now, but I can carry my end. And that’s enough. I love her still. In fact, there is nothing bad that happens that doesn’t have some good to it. I truly believe that. “For more than seven decades, Max and Bessie Cohen had shared a loving and productive life together, blessed by two children, four grandchildren and four great-grandchildren, and enriched by a wide circle of adoring friends….Both died Monday, ending 74 years and nine months of marriage- he from complications of dementia at 97, and she in her sleep at 94 – in the home they had shared since 1978 in Northwest Baltimore’s Pickwick Apartments.” Note: While the type of Dementia is not indicated, it was probably Alzheimer’s as this disease accounts for 70-80% of all Dementia cases. Obviously this disease did not change their loving relationship or marriage. Huffington Post (AOL News) 27 January 2012 contained another interesting related news item similar to the above story. “Long Married Couple Presley and Ethel Bradshaw Die Hours Apart” The news article indicates that this Kentucky couple had been married for 73 years when they died hours apart in a Louisville Nursing home. 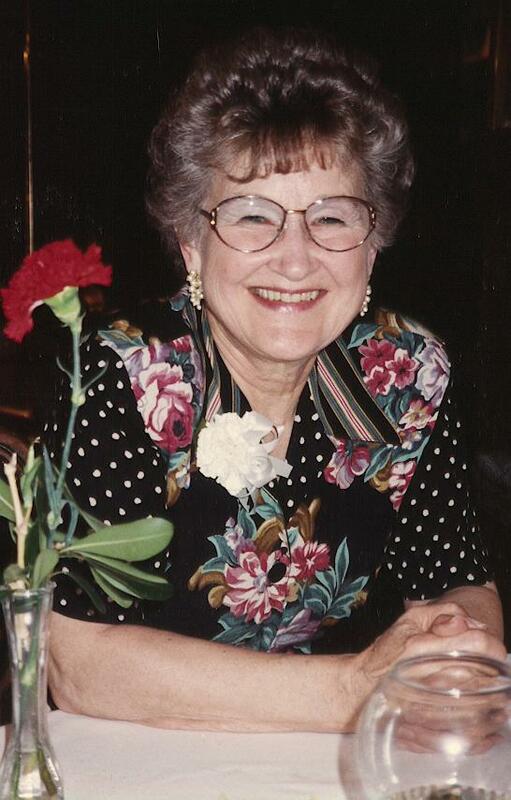 (Meadowview Health and Rehab Center) Ethel had entered the nursing home 4 years earlier when her health declined. It was said that she had “Dementia”. Again the type of dementia is not identified but it is assumed that it was probably Alzheimer’s because of the high prevalance of this type of Dementia. ”Presley, 101 visited his wife there several times a week…He would hold her hand, kiss all over her, tell her how much he loved her and missed her…two years later, he moved into the center to be with his wife...They were the true epitome of the word love, said Meadowview nurse Chasity Stoudemire…Presley died first, with Ethel following him four hours later. Though Ethel suffered from dementia, Bass (Director of Admissions) believes she was aware that her husband had died...it seems that long married couples are often intrinsically aware of the death of one spouse, perhaps because of their strong bond. The couple were married on Oct. 21, 1938 in Somerset, Kentucky”. Once again, this terrible disease did not affect the long standing marriage or the love of this husband and wife! On a lighter note… it was just a few days ago (10 November 2011) that WCCO-TV News aired one of their “good questions” feature series on how many times/frequently did normal couples have sexual relations…I rather facetiously but honestly made the following comment on the facebook page of Amelia Santaniello the WCCO-TV Anchor lady involved in the question. 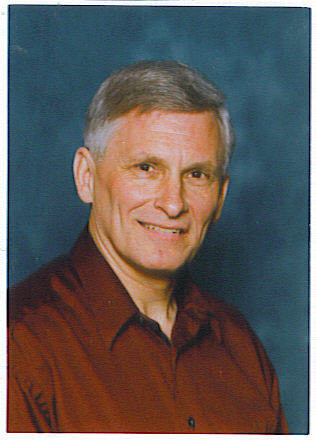 Stan's Note: As of February 2019, approximately 23,300 people have visited this page on June's Website,since it was first created in late 2011,. Alzheimer Society of Newfoundland and Labrador, Inc. - St John's, Newfoundland and Labrador - (25 February 2013): "Thank you so much for sharing! -Amelia White, Events Coordinator." Bryn Sineath - Hot Springs, Arkansas - (25 February 2013): "Shared..."
Susan Owen - Princeton, West Virginia - (19 July 2014): "I am not to this point with my husband who suffers with FTD. Reading your comments do help if and when I am faced with this situation. My husband and I will soon share our 42nd anniversary. It will go on whether or not he remembers. I will continue to love and care for him. Stanton you do make an excellent point. The move to a NH should be a partnership...with the NH being the better helping with the worse as we continue to love and cherish ...with help till the end. LOVE YOU ALL. Sunshine Suzy." G'Anna Martin-Dent - Amarillo, Texas - (19 Juky 2014):"Stan, I think it's amazing and loving what you did for June. It's a great testimony of your love for her. I care for my bedridden mother at home. She is unable to move and on liquids only. I just turned 43 so even with my MS I think it's easier for me to turn her, feed her, change her etc. It wears me out but I can do it. Now if I were in my 70's or 80's I doubt I could. Care homes are there for this purpose and I think you made a good point about how they can be a great an essential partner in your loved one's care!" Caroline Smith - Ashford, Kent, England - (19 July 2014): "I think there is a differents between sticking by someone with an illness because of duty no matter how they may feel inside or sticking by because you want to hold onto as much of your loved one as possible and want to be with them through it.We have spouses who come in every day without fail and some who visit once or twice a week I don't think they care less or love less they just have a different relationship." Carol Burns Loyer - Hamilton, Ontario, Canada - (19 July 2014): "When we got married and when we did our vows and said in sickness or health till death do us part... my husband has early onset Alzheimer's and when I found out he had this it was a given that I would care for him, not because its my duty to but its because I love him...in my opinion anyone that leaves a person knowing the person is sick never loved that person to begin with." Ola Lachney - Atlanta, Georgia - (19 July 2014): "Very interesting !" Jacqui Pebbles Keylock - Cirencester, Gloucestershire, United Kingdom - (19 July 2014): "I will look after my husband for as long as I can at home but as I am disabled too it is going to be very hard. I did help care for his Mum so I am aware of what the future holds. Saying that I know if it was me with dementia my Hubby could not cope with looking after me, not everyone can . As we all know it is very hard and not everyone is able to home care." Darlene Aube - Aurora, Ontario, Canada - (19 July 2014): "Married for life- through sickness and health." Louise Ann Howard - Batemans Bay, New South Wales, Australia - (21 July 2014): "Agree Stanton, it is for life no matter. We all have our battles. True love gets through everything."